Daniel Suarez took the lead from Kyle Busch Motorsports teammate William Byron on lap 141 of Friday night’s 150-lap Camping World Truck Series race and went on to earn the first victory of his career in the series. Byron lost the lead when is engine failed and as a result of his 27th-place finish, was eliminated from the Trucks Chase playoffs. Byron’s elimination from the inaugural Chase also helped teammate Christopher Bell, who claimed the last berth in the Championship 4 with a seventh-place finish. Bell joins second-place finisher Johnny Sauter, third-place Matt Crafton and fifth-place Timothy Peters with a chance to win the title next Friday at Homestead-Miami Speedway. Suarez pulled ahead of Sauter after a restart with four laps left and led by .510 seconds when he crossed the finish line for the final time. “He was running a perfect race and things like this happen,” Suarez said of Byron, who had led 112 of the first 137 laps before his engine began to fail. “The first victory in any series is always the most difficult to get. 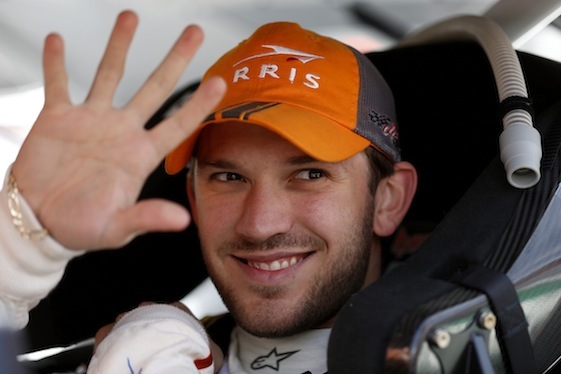 (2) Daniel Suarez(i), Toyota, 150. (4) Johnny Sauter (C), Chevrolet, 150. (10) Matt Crafton (C), Toyota, 150. (7) Cameron Hayley, Toyota, 150. (8) Timothy Peters (C), Toyota, 150. (6) John H Nemechek, Chevrolet, 150. (5) Christopher Bell (C) #, Toyota, 150. (17) Matt Tifft #, Toyota, 150. (18) Ben Kennedy (C), Chevrolet, 150. (12) Cole Custer #, Chevrolet, 150. (3) Rico Abreu #, Toyota, 150. (13) Tyler Reddick, Ford, 150. (15) Daniel Hemric, Ford, 150. (9) Ben Rhodes #, Toyota, 150. (21) Austin Cindric, Ford, 150. (14) Noah Gragson, Toyota, 150. (19) Myatt Snider, Toyota, 150. (20) Stewart Friesen, Chevrolet, 150. (23) Dylan Lupton(i), Chevrolet, 150. (26) Kevin Donahue, Chevrolet, 149. (27) Matt Mills, Chevrolet, 148. (29) Austin Wayne Self #, Toyota, 147. (28) Travis Kvapil, Chevrolet, 147. (32) Jennifer Jo Cobb, Chevrolet, 146. (30) Bryce Napier, Chevrolet, 146. (31) Norm Benning, Chevrolet, 145. (1) William Byron (C) #, Toyota, Engine, 141. (11) Kaz Grala, Chevrolet, Accident, 76. (25) Jordan Anderson, Chevrolet, Engine, 62. (22) Tommy Joe Martins, Chevrolet, Accident, 36. (24) Dominique Van Wieringen, Ford, Accident, 26. (16) Spencer Gallagher, Chevrolet, Accident, 11. Average Speed of Race Winner: 84.441 mph. Time of Race: 1 Hrs, 46 Mins, 35 Secs. Margin of Victory: 0.510 Seconds. Lap Leaders: W. Byron (C) # 1-25; D. Suarez(i) 26-47; W. Byron (C) # 48-68; T. Reddick 69-72; W. Byron (C) # 73-138; D. Suarez(i) 139-150. Leaders Summary (Driver, Times Lead, Laps Led): W. Byron (C) # 3 times for 112 laps; D. Suarez(i) 2 times for 34 laps; T. Reddick 1 time for 4 laps. Top 10 in Points: J. Sauter (C) – 3,103; M. Crafton (C) – 3,078; C. Bell (C) # – 3,077; T. Peters (C) – 3,075; W. Byron (C) # – 3,060; B. Kennedy (C) – 3,059; D. Hemric – 2,135; J. Nemechek – 2,111; T. Reddick – 479; C. Custer # – 479.